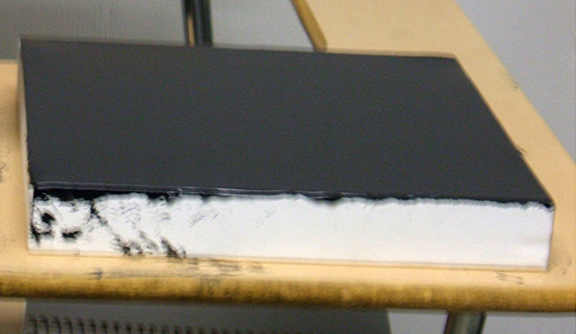 The Black Painting is a daily performance where one layer of black paint is applied to the surface everyday by Skip until his death or inability. The project began in 2007 on a store bought, pre-stretched 10'' square canvas and continues today. It is currently gaining approximately 6 pounds a year but grows exponentially. The piece began as an impulse to permanently connect to the material and practice of painting. It seeks to remove all aesthetic decisions of painting while still referencing the act of painting, performance, and the history of black paintings. (Kazimir Malevich, Ad Reinhardt, Robert Rauschenberg, Frank Stella, Ellsworth Kelly, Mark Rothko, and more) Unlike many black paintings of the past, this work is not intended to be the end or a new beginning but rather about the present moment.